refuse to work as swipe readers do." Smith notes that the largest challenge in upgrading to prox- imity cards was replacing all the students' cards. "We're a fully residential campus, and all the students had identifi cation cards that were swipe only," she explains. "We chose to pre-create all the cards for returning students with their existing credentials and photos. We sequenced them by living unit, assigning each living unit a specifi c window of time in which to pick up their cards. We similarly sequenced the cards for approximately 500 staff mem- bers. It was an expeditious way to handle this logistical challenge. Other than that, it was an easy transition." Considering all the services the DePauw card system offers, the fact that the transition was easy was a big benefi t. Specifi cally, the cards offer building access to University-owned residence halls and living units, laundry and vending charges, meal plan and food purchases at campus dining halls, and out-in-town purchases at local downtown restaurants. The cost of the upgrade is not quite as simple. Smith esti- mates total cost to install a swipe card reader at $3,000 per door. If each building has two doors, then infrastructure costs are approximately $6,000 per building. Additionally, the cost of card UPGRADE Softening the Financial Blow In 2010, Missouri Southern State University (MSSU), a public university with 5,500 undergraduate students in Joplin, upgraded its magnetic stripe Lion Card, which had only been used for identification and dining purchases, to a proximity card with a full complement of services, including access control, dining purchases, snack/beverage vending, printing, bookstore purchases, health center charges, and recreation center privileges. 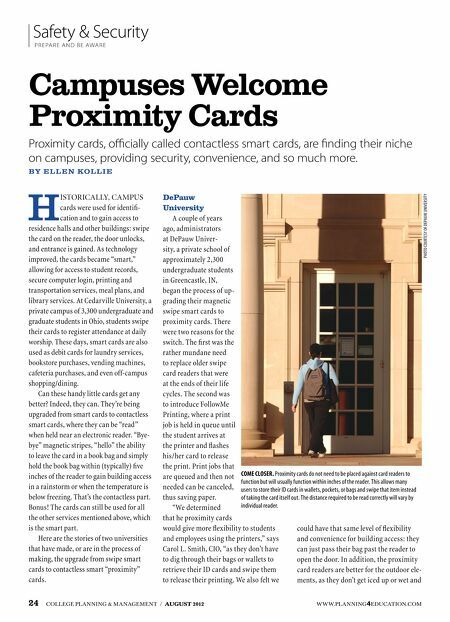 Chris Owens, manager of MSSU's Campus Card Service Center, notes that one of the deciding factors to move to a proximity card was the ability to charge for printing. "Because we started charg- ing for something that was once free, it had to be handled delicately," he says. Administrators did two things to help soften the blow. The first tool was a weeklong grace pe- riod. "Students logged in to print, but the charge was set to zero," says Owens, "so they could get used to using the new system." The second tool was visual. For one semester before implementing the prox- imity cards, Owens' department worked with the library staff to collect, on a daily basis, all of the printing that had not be picked up. "At the end of the semester," he says, "we had 69,000 sheets of paper that were a waste." That paper was boxed up and stacked against a wall in his department. "When students voiced their concerns about being charged for printing, we showed them the boxes and said that we could no longer continue to absorb the cost of all that waste." CPM Sustainable Design-Build Solutions Low in cost per square foot. Natural daytime lighting. Easy to relocate. Expandable. Call one of our ClearSpan specialists today at 1.866.643.1010 or visit www.ClearSpan.com/ADCPM. AUGUST 2012 / COLLEGE PLANNING & MANAGEMENT 25 stock is about $5 per card. "The upgrade is not inexpensive," she says candidly. "So we're upgrading a certain number of read- ers every year. It's worth the peace of mind the security gives students. Overall, we have a safe community, and the proximity cards allow students to feel safe, which is important because your residence hall is your home." The return on investment comes from the availability to restrict access through the system, as well as track access of who came and went in case an incident does occur. "It's critical for us to provide those resources and invest in that manner for our campus," Smith notes. University of Iowa Currently, the University of Iowa, a national research univer- sity of more than 30,000 students in Iowa City, is transitioning its magnetic stripe Iowa One Card to a contactless smart card. 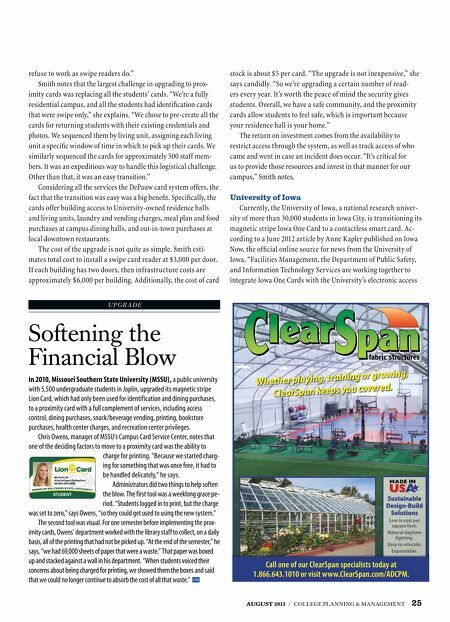 Ac- cording to a June 2012 article by Anne Kapler published on Iowa Now, the offi cial online source for news from the University of Iowa, "Facilities Management, the Department of Public Safety, and Information Technology Services are working together to integrate Iowa One Cards with the University's electronic access fabric structures Whether playing, training or growing, ClearSpan keeps you covered.